For the first half of today’s show, Glenn Beck went through a timeline to show how it was “inconceivable” that the Obama administration didn’t know and possibly work for the upheaval in the Middle East. For most host’s that would be enough. However, Beck didn’t stop there. 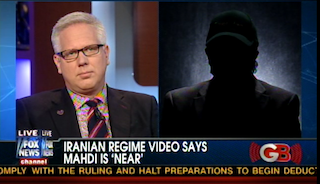 Oh no, he then brought in an ex-CIA agent shrouded in darkness to talk about how Iran is planning to destroy Israel and then America. The shadowy figure was Reza Kahlili which is the pseudonym used by a former agent who wrote the book A Time to Betray which purports to tell about his time inside Iran’s Revolutionary Guard. He provided the details about Iran’s plans for the region from an “undisclosed location,” while Beck and CBN’s Erick Stakelbeck talked up the connections between the Twelfth Imam and the Antichrist (we went over this last month). Normally, I’d summarize to you the terrifying things that Kahlili had to say, but I can’t. I’d like to tell you that the reason I can’t is that this topic is just too important and that you need to listen to it yourself and learn the truth so that you can be prepared. I’d like to tell you that. Unfortunately, the real reason is that the voice disguiser they used was so strong I couldn’t really understand a word of it. Seriously, transcribing these clips normally is a pain, I’m not gonna touch this one. I think he mentioned Israel a couple times. Does that help?